freedom of information rules for public authorities. flexible and easy to administer. Click on the right (<) or left (>) arrows for other design approaches. A more extensive design approach for councils working toward the NALC Local Council Foundation Award. Meet the Freedom of Information and Transparency regulations. Demonstrate compliance with the NALC Foundation Award including: action plan, progress reporting, consultation documents, policies and procedures. Click on the right (>) or left (<) arrows for other design approaches. Demonstrate compliance with the Foundation Award and in addition the Quality Award which includes additional information requirements from community engagement planning and reporting to internal management policies. scalable to add additional content. Demonstrate compliance withe the top Quality Gold Award with a website complementing the regulatory and award scheme requirements to provide corporate style performance management and delivery of council services while maximising the prioritised benefits for the community based on the community driven objectives. 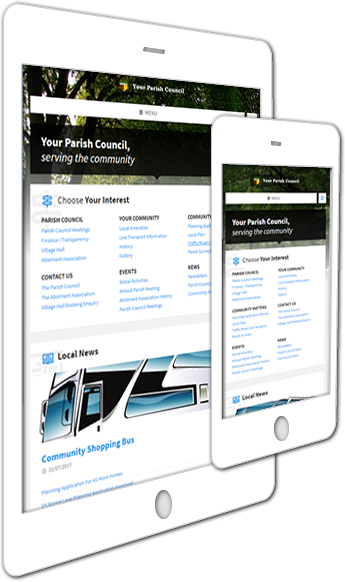 This design approach meets the regulatory needs of a smaller parish council especially parish councils with a turnover of less than £25,000 but this will equally meet the needs of many parish councils above this threshold. Click on the right arrow (>) or left arrow (<) either side of this page to review more complex website designs. The Freedom of information Act 2000 (FOI) requires that all public authorities publish information about themselves and their activities. The Information Commissioner’s Office (ICO) provides a model publication scheme to enable public bodies to be clear of their obligations. This is normally copied into a publication scheme prepared by each organisation which is annotated or linked to the relevant information. The publication scheme does not require the information to be published on a website but it is generally accepted that this is the easiest way to do so and so most public body websites have a “Freedom of Information” page describing the model publication scheme which has links to a hierarchy of other pages which ultimately lead to specific pages with the information to be published. Resilient; which means that it needs to be protected from deliberate or accidental deletion or corruption. Supported; i.e. for system updates and user assistance. We have designed this website to match the structure of the model publication scheme. All the information drops into the website in the way that it is listed in your published publication scheme. The Home page has an additional set of links that are often described as “Your area of interest” which provides visitors with quick links to regularly used pages and information that you want to give a high prominence. the involvement with the community as a part of council activities and social, cultural and sporting activities. Our objectives for the future, our plans for getting there and regular progress updates. Council meetings and parish meetings and delegated decisions. our written procedures and policies. asset registers and other lists. a responsive i.e. designed for phones and tablets as well as laptops and desktops. automatically backed up to a secure data centre. compliant with government guidelines for local government websites. 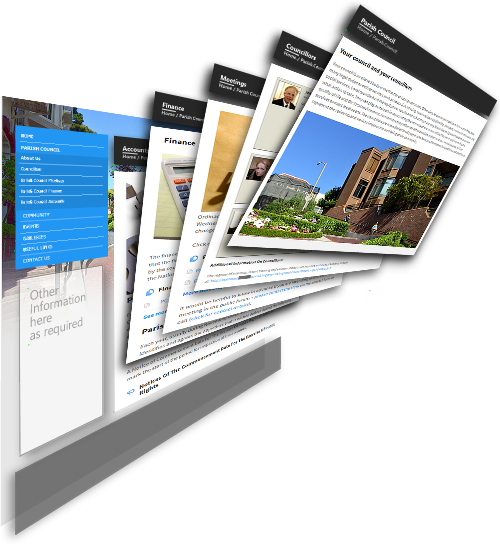 scalable, allowing your website to grow and cover additional topics and provide additional features as the council’s publishing ambitions grow. easy to update with notices, news and documents. easy to handover to a new clerk or administrator with step by step user guides. easy to add news, articles, images, photos and surveys, additional information pages much like creating new Word documents. Once we have clarified your requirements we can add additional pages that are of community benefit such as lists of community organisations, services from the local authority and other public service providers. We can supply stock images to add visual content but we prefer to use as many images as possible from your area to provide a familiar and distinctive visual theme. For councils progressing toward the achievement of an award from the NALC Local Council Awards scheme we offer websites to complement the scheme. Click the open Council Website slider above to vew the additional content for each award level. Any modern website needs to be responsive which means that the layout of a web page is automatically reconfigured in response to the device on which it is displayed. 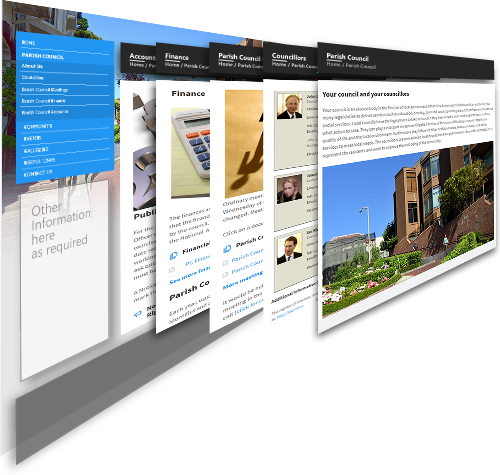 Our websites are responsive and will look good on a phone screen, a tablet computer or a desktop or laptop computer.